My intent with these couple of articles is to bring to light the idea that the occult has been 'occulted' (gee…eye roll) for thousands of years, kept out of its link with science, twisted in a lot of ways and made to look silly for a very good reason. Should we discover the link between this information and hard science, we would no longer be controllable. Period. It took the current researchers close to 50 years to figure it out because of the mainstream conditioning around this subject. That conditioning was also a tool used to compartmentalize every part of this line of research. But once you look, you realize the very foundation for the science of the next step is linked to consciousness. I will start this part out with an occult term called 'Egregor' or 'thought-form'. Rather than go into an intense discussion of what it is, I refer you to my article "Don't Feed the Memes". One of the less talked about and eerie things that happened at Montauk and that was rumored as one of the reasons the entire place was shut down, was the creation of an egregor called The Montauk Monster. Usually, to have the psychic energy required to create a strong enough thought form to have a 'life' of its own, a great number of people are required over many, many, years to put their heart-felt emotion into the thought form by using ritual (such as a church service or other form of ritual) and focusing these 'prayers' or their excited energy into it thereby, feeding the thought form with that energy. It seems the Montauk chair was developed to take a single mind and increase its amplitude to the point where that one mind had enough power (without the requisite discipline required to do this on its own) to pilot a craft, find a place in the space time continuum, communicate telepathically and or open a portal in time. But all it takes is one undisciplined mind, one moment (or several) of misdirected thought to create and unleash a huge potential while using this technology. Voila! You have your free roaming energetic 'monster' thought form, full of the rage of one person. I could take this into a discussion of ghosts, free roaming apparitions, shadow people, jinn, daemons, and Extra-dimensionals, because anything we cannot see, pinch or weigh, we tend to ignore as unreasonable, or imaginary. However, I will just say that we are NOT the only things that inhabit even this dimension naturally, not even counting the life forms, beings, that came through all of the portals we have opened up in the last 70 years from all the experimentation, before we knew what we were doing! Life as we know it, intelligences, actually exist above and below what we are capable of sensing. Fact. So just deal with it. In a way, mankind is capable of even creating a rudimentary form of intelligence and imbuing it with life, in the egregor. Scary thought, uh? No wonder they don't want us to find out about this! What we are NOT capable of at this point however, is understanding this science because our minds and our spiritual development is so lacking. The short life spans we all have make it almost impossible to evolve far enough the way we need to, to develop this awareness. BUT the potential is there. When the potential is amped up artificially, as in the Montauk chair, is when we run into trouble, not only with our selves but with our spirits. We become disjointed, separated from our whole being because to create the technology interface we artificially cut our connection to the rest of our beingness, hobbling our sense of spirit, empathy and what is right. We are experiencing some of this now with the way we are treating others and the world. The price we are paying for it is extremely high. Now we that we have the tech to interface with this 'higher' realm, it is being utilized, even if Joe Smith on the street is not aware that it might be effecting him, it is. Not only has he been a Guinea pig, but he is now being caged mentally and spiritually by it. Let us see what might have led to this and how it is being accomplished. 1960 Although there were abductions happening before this, the first truly publicized case was that of Betty and Barney Hill. Contact in the modern era was happening as far back as 1932, with such people as Howard Menger, George Adamski in the 1950's (and his contact with the nordics/ maybe Agarthans) and George Van Tassel in 1953. Then as we got into the 60's a very odd, mixed phenomena started to emerge. The abductions changed in nature from friendly, to frightening and abusive, and many times these abductions had all the earmarks of a military abduction, the MKULTRA technology, written all over them. The victims would have screen memories in place of their real memories of the event, in actuality that is how this term was coined. They would sometimes have radiation symptoms and all would experience the psychological symptoms of PSTD. I think it would be very sound to say that at this point there were double abductions going on, one where the ET/ED contact happened first and then the abductees would be re-abducted by the military and MKULTRA techniques were used to not only find out intel from the abductees, but also control their narrative and how much they remembered, especially depending on which ET race did the abduction. There was a schism going on between the military and the ET race that Eisenhower made the original treaty with for technology. This race never intended to hold with the letter of the agreement. You see, we were to get technology in exchange for an agreed upon amount of abductions done by the ET race and they were to give an accounting of who they abducted and when they abducted them. The ET race did neither, abducting way over their quota and not reporting to our government who they took and sometimes not returning these people. When it became apparent to the military that the ET race was breaking contract, the military started re-abducting the abductees to get any and all information from them about the ET race they could and what they were doing to these people. It was a 'get any information out of them any way you can' scenario, implant them with tracking devices and then wipe their minds of the entire event. This was NOT done kindly. I am sure they saw it as necessary casualties of war. It is rumored this race were the Draco's and their Grey CBE (created biological entities)workers. This was the start of the MILABs Program. MILAB stands for Military Abduction. The phenomenon was investigated by Dr. Helmut Lammer of the Austrian Space Research Institute. In a number of cases abductees, and sometimes UFO witnesses, are subsequently abducted by humans in military uniforms. Nearly always unmarked helicopters are involved. The victims are usually drugged or sometimes disoriented by a strong electromagnetic field. During their military abduction most of them receive an implant, usually behind the ear. MILABs seem to be a part of a wider operation, aimed at monitoring and abducting abductees in order to keep a lid on the alien abduction phenomenon. transport by helicopter bus or truck to an unknown building or an underground military facility. In other scenarios it is quite evident given Corey Goode's latest testimony that some of these abductions were done by the break-away civilizations underneath the earth. Otherworldly Journeys to strange underground places are common in UFO abductions and Dr. Thomas Bullard found a specific pattern in Otherworldly Journeys in his abduction research [4, 5]. Dr. Helmut Lammer's conclusions are as follows and I think they are valid. MILABs could be evidence that a secret military intelligence task force has been operating in North America since the early eighties, and is involved in the monitoring and kidnapping of alleged UFO abductees. And THE ABOVE IS OLD INFORMATION!!!! The next item is Neuro-feedback. This area of study came directly out of Project Montauk and earlier studies exploring the electrical nature of the brain. In 1924, the German psychiatrist Hans Berger connected a couple of electrodes (small round discs of metal) to a patient's scalp and detected a small current by using a ballistic galvanometer. During the years 1929-1938 he published 14 reports about his studies of EEGs, and much of our modern knowledge of the subject, especially in the middle frequencies, is due to his research. Berger analyzed EEGs qualitatively, but in 1932 G. Dietsch applied Fourier analysis to seven records of EEG and became the first researcher of what later is called QEEG (quantitative EEG). This led into research that was aimed at reverse engineering the brain to create faster, better computers. A faster computer is always better, a smart computer is even better yet, but a computing base that is fast enough to replicate a human brain, perhaps even go faster, well, quantumly speaking, faster than light computing? Extradimensional computing? One of the things this has led to are AI computers like Jade 2, debuted with JH15 this year. (She is she, don't ask how I know, I just do.) Notice this is the second computer, not the first. In 1999, the operational tool used for managing force deployment planning in the U.S. military was the Joint Operation Planning and Execution System (JOPES). The JADE tool for rapid crisis action planning had been developed by BBN Technologies under a contract to DARPA within the ARPA-Rome Planning Initiative, but was available only in a prototype environment. In subsequent years, JADE was successfully demonstrated(p24) and then integrated into the Global Command and Control System (GCCS) and the Adaptive Course of Action (ACOA) environment while meeting the requirements of the Defense Information Infrastructure Common Operating Environment (DII-COE). In 2015, it was alleged that a so-called JADE II system had been implemented with more advanced capabilities, including Artificial Intelligence (AI) technology that is cognitive and intuitive, whereby it can examine prior executed battle plans and devise new and better strategies, and also using Network-Centric Warfare (NCW) and the Global Information Grid (GIG). It was alleged that the system's advanced knowledge of the human domain include predictions of human behavior, with claims that information for this knowledge was collected by NSA data mining. It was also alleged that the military exercise codenamed Jade Helm 15 was a beta test of the JADE II system, wherein the process of decision making and taking action is expedited by putting the system in direct control, with human decision making taken out of the loop. Which takes up directly into RNM Remote Neural Monitoring. Here is where is gets even more fantastical… One must ask WHY would anybody want to know the thoughts of every person on this world? Well, if Jade2 is to be the success they want it to be, then it must have that information. The underlining technology of this system takes under consideration that the electrical activity in the speech center of the brain, can be translated into the subject’s verbal thoughts. R.N.M. can send encrypted signals to the audio cortex of the brain directly circumventing the ear. This encoding assists in detecting audio communication. It can also perform electrical mapping of the cerebrum’s activity from the visual center, which is achieved by avoiding the eyes and optic nerves, consequently projecting imageries from the subject’s mind onto a video display. With this visual and audio memory, both can be visualized and analyzed. to effect a desired change in electrical activity therein. U.S. Patent 5,159,703 – SILENT SUBLIMINAL PRESENTATION SYSTEM. REMOTELY DETERMINING INFORMATION AS TO A PERSON'S EMOTIONAL STATE. 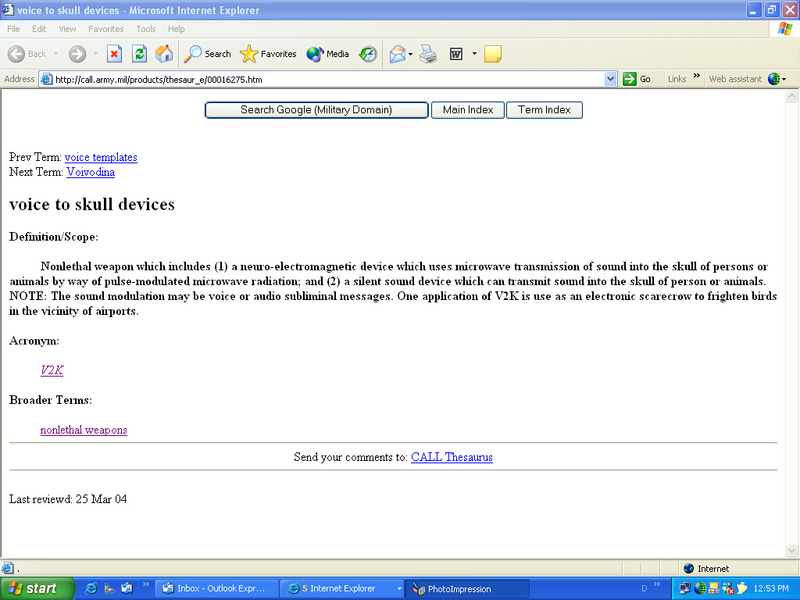 U.S. Patent 6,014,080 – BODY WORN ACTIVE AND PASSIVE TRACKING DEVICE. (Global Positioning Satellite) LOCATION INFORMATION. By now, I am sure you have all put 2 and 2 together and have realized part of what HAARP technology is being used for…. However, I think most of the conspiracy theory out there on HAARP could be true, I think its real use, once you take all the gilded gold off of it is for the above project of eventually invading the mind of every person alive n the planet… ok…get your tin foil ready! The individual may think that the most important reality is his own existence, but this is only his personal point of view. This lacks historical perspective. Man does not have the right to develop his own mind. This kind of liberal orientation has great appeal. We must electronically control the brain. Someday armies and generals will be controlled by electric stimulation of the brain." HAARP was a target of conspiracy theorists, who claimed that it was capable of modifying weather, disabling satellites and exerting mind control over people, and that it was being used as a weapon against terrorists. Such theorists blamed the program for causing earthquakes, droughts, storms and floods, diseases such as Gulf War syndrome and chronic fatigue syndrome, the 1996 crash of TWA Flight 800, and the 2003 destruction of the space shuttle Columbia. Commentators and scientists say that proponents of these theories are "uninformed", because most theories put forward fall well outside the abilities of the facility and often outside the scope of natural science. HAARP is the subject of numerous conspiracy theories. Various individuals have speculated about hidden motives and capabilities of the project. For example, Rosalie Bertell warned in 1996 about the deployment of HAARP as a military weapon. Michel Chossudovsky stated in a book published by the Committee on Monetary and Economic Reform that "recent scientific evidence suggests that HAARP is fully operational and has the ability of triggering floods, droughts, hurricanes and earthquakes." Over time, HAARP has been blamed for triggering catastrophes such as floods, droughts, hurricanes, thunderstorms, earthquakes in Iran, Pakistan, Haiti, Turkey, Greece and the Philippines, major power outages, the downing of TWA Flight 800, Gulf War syndrome, and chronic fatigue syndrome. The HAARP project directs a 3.6 MW signal, in the 2.8–10 MHz region of the HF (high-frequency) band, into the ionosphere. The signal may be pulsed or continuous. Then, effects of the transmission and any recovery period can be examined using associated instrumentation, including VHF and UHF radars, HF receivers, and optical cameras. According to the HAARP team, this will advance the study of basic natural processes that occur in the ionosphere under the natural but much stronger influence of solar interaction, and how the natural ionosphere affects radio signals. This will enable scientists to develop methods to mitigate these effects to improve the reliability or performance of communication and navigation systems which would have a wide range of both civilian and military uses, such as an increased accuracy of GPS navigation and advances in underwater and underground research and applications. This may lead to improved methods for submarine communication or an ability to remotely sense and map the mineral content of the terrestrial subsurface, and perhaps underground complexes, of regions or countries, among other things. The current facility lacks range to be used in regions like the Middle East, according to one of the researchers involved, but the technology could be put on a mobile platform. The microwave auditory effect, also known as the microwave hearing effect or the Frey effect, consists of audible clicks (or, with speech modulation, spoken words) induced by pulsed/modulated microwave frequencies. The clicks are generated directly inside the human head without the need of any receiving electronic device. The effect was first reported by persons working in the vicinity of radar transponders during World War II. These induced sounds are not audible to other people nearby. The microwave auditory effect was later discovered to be inducible with shorter-wavelength portions of the electromagnetic spectrum. During the Cold War era, the American neuroscientist Allan H. Frey studied this phenomenon and was the first to publish information on the nature of the microwave auditory effect. In 2003-2004, the WaveBand Corp. had a contract from the US Navy for the design an MAE system they called MEDUSA (Mob Excess Deterrent Using Silent Audio) intended to remotely, temporarily incapacitate personnel. The project was cancelled in 2005. A 1998 patent describes a device that can scare off birds from wind turbines, aircraft, and other sensitive installations by way of microwave energy pulses. Using frequencies from 1 GHz to about 40 GHz, the warning system generates pulses of milliseconds duration, which are claimed to be sensed by the birds' auditory systems. It is believed this may cause them to veer away from the protected object. As stated by the above-mentioned journal entry to the American Psychologist, "the averaged densities of energy required to transmit longer messages would approach the current 10mW/cm² limit of safe exposure", which makes the technology improper for human telecommunication. For this very same 'receiverless' wireless sound transmission to human beings, sound from ultrasound is used instead. 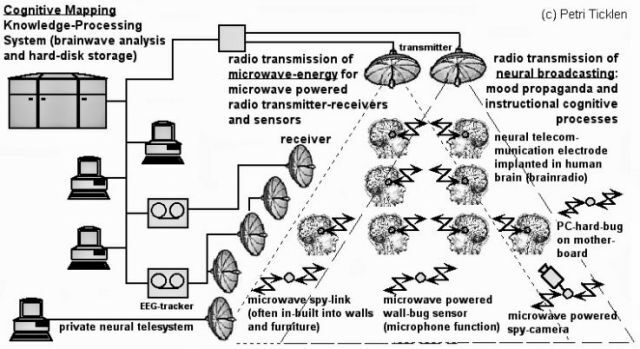 Numerous individuals suffering from auditory hallucinations, delusional disorders or other mental illness have alleged that government agents use forms of mind control technologies based on microwave signals to transmit sounds and thoughts into their heads as a form of electronic harassment, referring to the technology as "voice to skull" or "V2K". There are extensive online support networks and numerous websites maintained by people fearing mind control. California psychiatrist Alan Drucker has identified evidence of delusional disorders on many of these websites and other psychologists are divided over whether such sites negatively reinforce mental troubles or act as a form of group cognitive therapy. There has been speculation about military sonic weapons that emit highly-directional high-intensity sound; however, these devices do not use ultrasound, although sometimes thought to do so. Wikileaks has published technical specifications of such sound weapons. A sound signal can be aimed so that only a particular passer-by, or somebody very close, can hear it. In commercial applications, it can target sound to a single person without the peripheral sound and related noise of a loudspeaker. IMHO whether we know it or not, whether we can perceive, conceive, believe it, WE ARE IN TROUBLE. In my next and last article I will explore some of the more convoluted theories as to why. Hold on to your hats. What chair? Follow the evidence. Consult with LMH. Maybe she will show you a picture of the chair. Nicely done, Alison. Very nicely done. BTW, a primer is out there. Davitch.